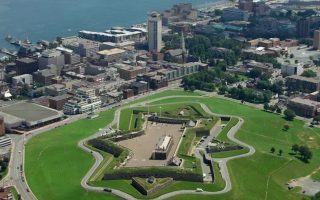 Founded in 1749, Halifax is a lovely coastal city, and is the economic center of Atlantic Canada, with a population of nearly 400,000 including the municipalities of Darmouth and Bedford. It is an important business destination in Canada and a popular tourist spot in summer. Downtown Halifax is hilly, compact, and largely defined by the water. The main part of the city is only 9 km north-south, and about 3 km east-west. It is hilly east-west and flatter north-south. 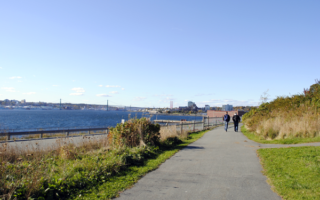 Running in Halifax has a great mix of waterfront, hills, parks, and paths. 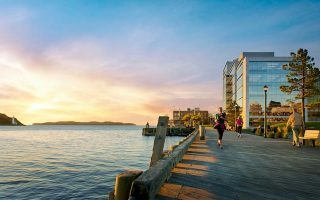 The best places to run in Halifax are accessible from downtown hotels. 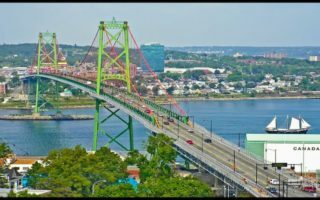 Highlights include running along the vibrant waterfront, several public parks including signature Point Pleasant Park, Victorian-lined residential streets in the South End, and over the the bridge to Dartmouth, which hosts some good running spots as well. If you have time — and a car — good running ‘destinations’ include the BLT Trail, the path around St. Margarets Bay, and the Dyke Land trails in the Annapolis Valley. Public transport consists principally of a good municipal bus system. A passenger ferry connects to Dartmouth. Thanks to Bruce at Running Room Halifax for their help with this guide! A wonderful run along the Halifax waterfront. Dedicated boardwalk most of the way, with great views of the water and harbour. Lots of great shops, restaurants, and important Halifax sights along the way. A 5-mile Halifax 'runseeing' tour. Includes the Public Gardens, Halifax Public Library, Dalhousie University, Halifax Common, and the Citadel -- a National Historic Landmark. 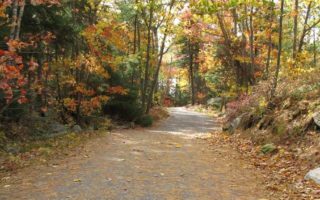 The longest off-road trail in the Halifax metro area. Popular paved bike trail heads west from the city, passing by five lakes, to Lakeside. Connects to the BLT Trail and then the Margarets Bay Trail. A guide to some of the more pleasant residential and commercial streets for running. Enjoy tony shops, restaurants, historic Victorian homes, and colorful wood frame houses in this compact city! Hilly E-W, flatter N-S.
A spectacular one-way run from downtown Halifax, crossing over to Dartmouth on the Macdonald Bridge and then running along the waterfront trail to Woodside Park. From there, take the ferry back to Halifax! A great run in Dartmouth, across from Halifax Harbour. 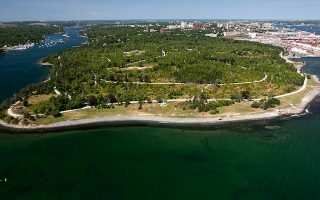 Do a ~1 mile jaunt around Dartmouth Common, then along a the waterfront trail between Alderney Ferry terminal and Woodside Park. Option: run from Halifax and take the ferry back! Dartmouth's version of Point Pleasant Park. About 6 km northeast of downtown Dartmouth. Extensive series of trails. 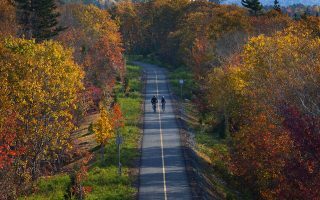 Also connects with a greenway system heading south of the park, and the Trans Canada Trail. 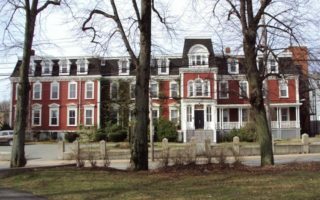 The Halifax climate is defined by its proximity to the ocean, which keeps the city milder in winter considering its latitude and cooler in the summer. Summers are pleasant, with average highs in the mid-70s (23C), and cool-ish nights. Due to the ocean, it can take awhile for summer to ‘arrive’, with August being warmer than July and September warmer than June. Northern latitude and Atlantic time zone translates into late sunsets in summer. Fall is a lovely season, and tends to hold on until the end of October. Winters can be very cloudy and wet, with plenty of snow and also lots of ice and rain, with frequent freeze-thaw cycles. Average highs in January are just below freezing, and lows are about 18F (-7C). Runners should be prepared with proper clothing and Yaktrax. Spring can be frustrating, as the ocean keeps temps cool and skies overcast. One should always be prepared for clouds and rain in Halifax. 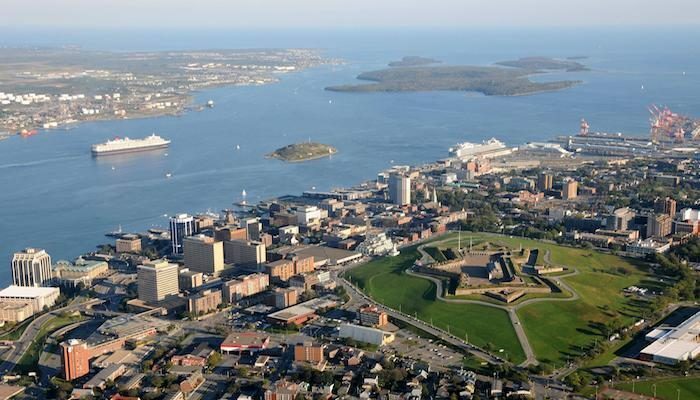 Halifax is a compact city and most of the hotels are located in the business and tourist district downtown, east of Robie St., between Cogswell St. and South St., north-south. Signature harbor hotels include the Westin Nova Scotian and the Marriott Harbourfront. The Lord Nelson is one of the older, more historic hotels. Newer, chic spots include the Cambridge Suites. There are also traditional chain hotels such as Delta, Residence Inn, Hampton Suites, and so on. In downtown Dartmouth, there’s a Holiday Inn with nice views of the water and the Halifax skyline. Running Room is the signature running store in Halifax, with locations downtown along the Spring Garden Rd. commercial corridor and to the north in Bedford in the Sunnyside Mall. Group Runs Wednesday 6:00 p.m. & Sunday 8:30 a.m.
Aerobics First. The other indy running store in Halifax. Turns into more of a winter/ski apparel store in the winter. Scotiabank Bluenose Marathon. May. Premier event with marathon, half, 10k, youth run. Maritime Race Weekend. September. Races of four distances. Really fun weekend for runners. Epic Canadian Race. Unique event on July 1. There’s a version of this in Dartmouth. Sole Sisters Running Event. June and October. Popular all-womens races.